Since this is our first meeting, I would like to start our cyber relationship by offering you an uncomfortably tight virtual hug. You need one, right? If you stumbled across my page, you might be a member in the big, bumbling, wonderful club that is Blended Families. If you are like me, you may not have been aware that at no additional cost, membership also includes a lifetime position in the Man-Eating, Gold-Digging, Home-Wrecking Evil Stepmothers Club. You don’t even have to apply! It’s automatic! Your husband’s ex-wife will provide ample, constant, and some might say even excessive recommendations to the voting board (your new stepchildren) and your membership will be assured. Ladies, it’s your job to get kicked out of that club. For some of you, it will be easy. For others, not so much. For a select few of you, your adoring stepchildren will sing your praises as you braid their hair and craft haikus about how perfect your newly blended family is. If you’re in the last category, please get out. Okay, okay…you can stay. Your time will come. Puberty. Breakups. You’re not immune, my comfortable friends. Now that we’re clear on the basics of membership, you might be wondering how to answer the question “Why would anyone want to do that to themselves?” Sign up for a lifetime of stressful weekends, awkward family functions, holiday visitation jigsaw puzzles, etc? WHY? Because it’s worth it. It’s that simple, and that’s what you have to remember. Because you love the person that you married (or are going to marry), and for that reason, you had better love what comes with that person with every ounce of love and understanding that you can muster, or you will find yourself right back where you started, and the kids will suffer more than they already have in the aftermath of their biological parents’ breakup. No pressure. 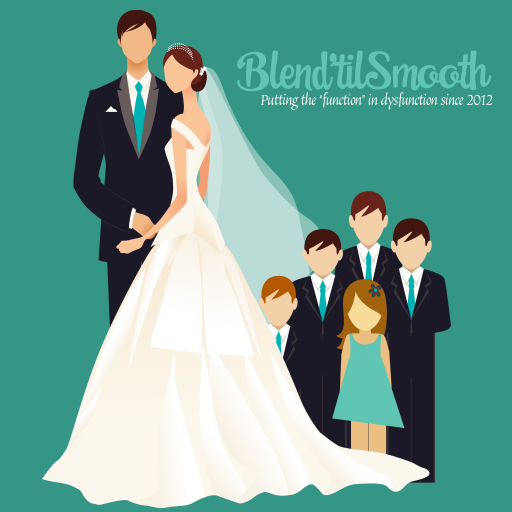 Blended families need the kind of support you can’t find in the average self-help book. I don’t mean to imply that I have all the answers that the books lack. I don’t. Most days, I don’t even know what the question is, let alone how to answer it. What I do have, is a very supportive husband, who happens to be my best friend; 5 wonderful, silly, sweet, kind-hearted kids (step and biological); an extended family who rallies behind us and treats all of our kids the same; and most importantly a strong faith in God. Somehow He never gets tired of my pitiful pleas for wisdom and my constant apologies for screwing it all up. This is not a blog to bash exes, rant about step kids or trash your spouse. That being said, my primary language is sarcasm, and honestly, if I don’t joke about it, it’s probably not important to me. My family–all of it, in all its forms–is of the utmost importance to me. So prepare for the sarcasm, friends. It’s my medicine and I hope that in some small way that it helps heal you too. Well done, Lori! I read all three posts. Touching! One comment on your first post…your primary language is sarcasm? Where did that come from? Nobody else in our family speaks sarcasm! Must be from your dad’s side of the family! Thank you so much, V. Some of your war stories are legendary. : ) We all have our moments, to be sure, but our kiddos are loved by three parents and an army of extended family, and that goes a long way. Can’t imagine life without all of them–sometimes it’s hard to remember what it was even like before Brian and the boys were in our lives. We need to call you soon to hear how life is treating you post-Wolter. I can venture a guess. : ) Miss you! Hi Lori. I’m so glad that Sara happened upon your blog earlier this week and turned me onto as well. You certainly have the gift of being a fantastic writer. Keep up the good work and hopefully your large blended family’s path can intersect with ours at some point in the near future. We’d love to get together…in a large, open space of course. 9 kids in a confined area could cause certain doom, or at least minor damage. Thanks so much for sharing your writing. Hi, Matt! Thank you so much for the kind words–it’s great to hear from you! I think about you and Sara often, and would love to get together soon. And yes, an airy field somewhere would be an ideal meeting place for the army of kiddos we are collectively rearing. We need to just find a time on the calendar and make it happen. I will text your lovely wife to see what scheduling magic we might be able to work. Thanks again for reaching out, Matt. Hope to see you all soon! I’m both amused and terrified! As a widow with four kids this is quite possibly in my future. Thanks for the honest look at what to expect.